I’m often a few steps behind when it comes to almost everything! But once I get there I’m on a roll. My husband and I do not have cable television. In fact we don’t even get a local signal. We’re just too stubborn about that, but we do enjoy movies and of course, Netflix: Watch Instantly. A few weeks ago, we finally discovered Mad Men. And I’ll admit, I’m not the biggest fan. For the most part, the characters are a bit empty and forgettable. See, I’m snobby when it comes to TV! I even work in the animation industry, so the work environment on the show hits a nerve. However, that lack of substance is made up in the lifestyle portrayed in the show. Regardless of what’s going on, I do love watching Joan Holloway walk across the office just to see what sort of accessories she’ll be flaunting, whether it’s a brooch on her sweater, long necklaces, handbags, gloves, earrings, I’m starstruck! Plus, who doesn’t want an endless supply of cigarettes and scotch? The style of the show’s characters has become so influential, many of those vintage trends are popping up in this fall’s fashion. Banana Republic is even coming out with an entire line of Mad Men inspired pieces. But!!! Jumping on this bandwagon and watching tutorials on how to wear the perfect beehive, just doesn’t seem to be my style. I’m choosing to opt out of this trend. Mainly because an attempt at this look will appear more Halloween costume than lifestyle. It’s lovely and feminine but not me! However, there is no doubt that there are some really cute and fun things out there and adding a few Mad Men-inspired accessories is a cheaper alternative than tweed skirts and long red fingernails. 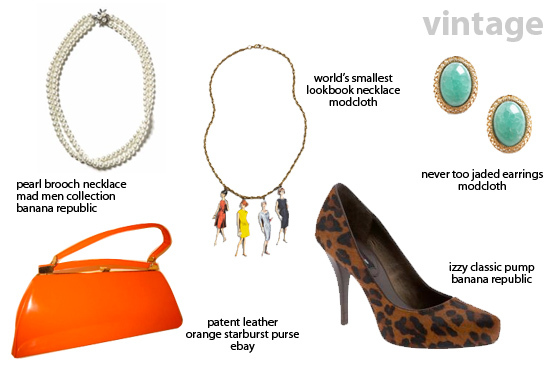 I put together a little crush list of fun vintage stuff that I hope you love as much as I do! Happy Monday!